10mm x 1/4 gas out compression fitting Gas It - GAS IT Leisure Gas Bottles, Gas Cylincers and Gas Tanks - Catering, Motorhome, Campervan, Caravan, Farrier and Road Repair Refillable Gas Solutions. 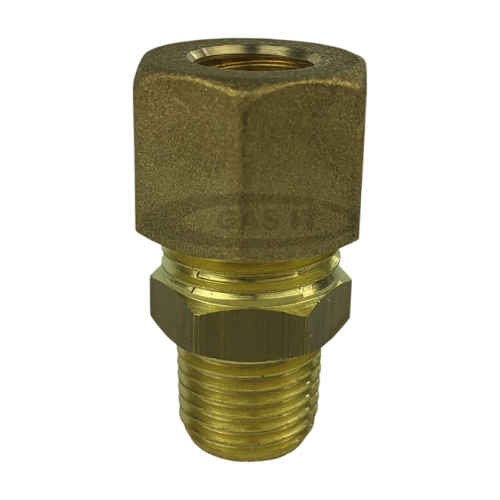 If you don't want to use the standard pigtail or an on vapour tank regulator, then this brass 1/4 male x 10mm compression olive fitting is a direct replacement to the tanks already fitted 109 ( butane type nut) on our GAS IT refillable horizontal vapour tanks and it will allow you to run 8mm copper or thermo plastic gas pipe directly out of the tank lock off valve up to your other regulator source. So if you have a existing bulk head regulator fitted and want to continue using it, this item will allow 10mm from the tank up to your regulator, and with a simple 8mm to W20 caravan adapter ( available separately on this webshop ) you can run directly in to your reg. It allows more convenient pipe runs from the gas out manual tap, as you can use any length of the specific approved copper 10mm pipe.